Joy and raptures; praise be, release the doves….a miracle has occurred. I am in an exercise class and not only am I beaming with glee, I’m keeping up with the choreography. This. Has. Never. Happened. Ever. Not Once. If I wasn’t already waving a glow stick, I’d suggest buying some to celebrate. 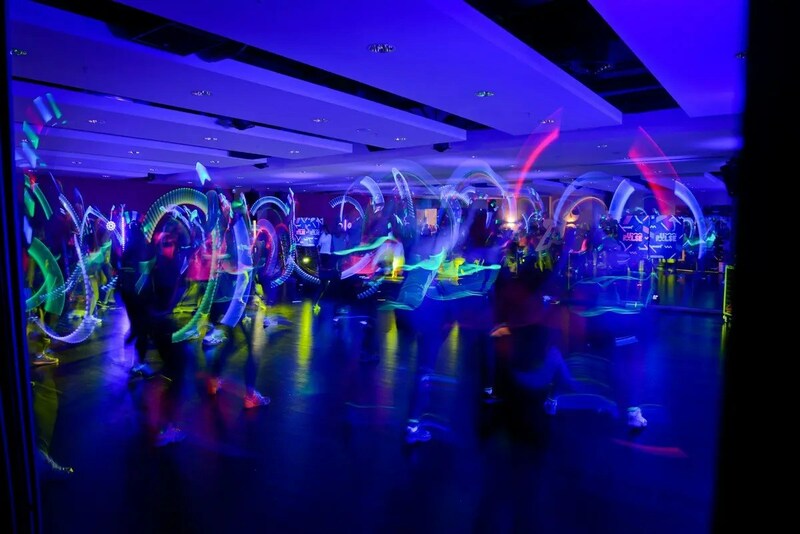 Clubbercise – and Pulse pbC – have been created by Claire Burlison Green. She was at the class I did and I got the chance to tell her how much I’d enjoyed the class – in fact my exact words were ‘it’s the first class I have done in ages that hasn’t made me want to cry at some point’. Surprisingly, Claire’s reply was not ‘get lost you saddo’ but ‘that’s why I invented it.’ She told me she’d gone to a dance class at Pineapple studios, couldn’t get the hang of it, the teacher had picked on her and she felt like crying. At that point she says she thought ‘I never want to feel like this again and so I decided to create a class where that would be the case for everyone in the room.’ Well she did exactly that, in spades. 1) It’s done in the dark. That’s right, no super bright lights highlight anything wobbling that shouldn’t or you going the wrong way. The studies is lit with UV lights to make any flouro numbers you choose to wear shine. That means no-one, even the instructor, can really see what you’re doing. 2) You wave glow sticks. For some reason, having them in your hands makes every move a bit easier. 3) You don’t move much…don’t get me wrong, you’ll raise your heart rate, sweat like a demon, jump about like a loon, work muscles enough to have a nice ache the next day, and, my Fitbit told me I’d burned 370 calories in the hour….but you do all this in a realtively small spot of personal space. This limited amount of movement also limits how complicated the series of moves are that you can do. 4) You probably know the songs….they’re a mix of 90s and noughties club classics – think Jump Around by House of Pain, Set You Free by NTrance, I Like To Move It by Reel 2 Reel, and, the choreography to them is pretty instinctive. One of the reasons I find classes so hard to follow is that the steps never seem to do what I want to do naturally but this really does. When the music is slow, you slow and do more toning type moves, when it kicks off so do you….and I’ll give you three guesses what happens during the ‘jump, jump, jump’ bit of House of Pain? This really did make it easy to follow. At some points I could actually guess what was coming next. 5) Those slow breaks also give you a chance to catch your breath a bit which is good if you aren’t quite confident about your fitness level and ability to manage a full-on dance class. So, in case you havent picked up on this – I really loved it. It’s brilliant fun, a good cardio workout and absolutely Gym-spiring. I actually wish I was still a member of Virgin Active so I could go. The good news is while Pulse powered by Clubbercise is Virgin Active members only, check timetables at your local class, Clubbercise is open to anyone. Visit their website to find your nearest class – mine seems to be Monday nights at 7pm. Not that I’ve checked or anything.